When James Cameron filmed his blockbuster Titanic in 1997, he went down to the actual Titanic wreck site because he wanted to include the actual grand old lady in his movie. While the ocean at 12,000 feet down definitely presented a challenge, Cameron was able to incorporate actual Titanic footage into his amazing movie about the doomed liner. It took a lot of new technology in order for Cameron to be able to use the real Titanic in his movie, and while he was there, he thought… why not take the time to do a little more exploration of the inside of the Titanic? The movie Ghosts of the Abyss is an amazing movie because it shows what the crew went through not only when they filmed Titanic, but also the exploration into the wreck that Cameron wanted to do. The movie shows actor Bill Paxton, who was asked personally by James Cameron to tag along, and he also served as the movie’s narrator. The crew arrives on the Russian cruiser, Keldysh, and after the goodbye’s, and the audience even gets to see Cameron’s wife Suzy Amis, and their daughter, and then it is all aboard for a once –in-a-lifetime adventure exploring the wreck of the most famous ship in the world. Some of the most famous Titanic historians could not resist the change to go inside the Titanic, and all but leaped at the chance that James Cameron offered them. The movie shows Cameron talking to many of them, and they also had many deep conversations about what everyone must have gone through the really horrible night when the Titanic was going down. The choices those poor people had to make, the women and children leaving their men behind, what would modern men do if they were faced with the same situation? Would they meekly choose to stand back and send their families away? It was interesting to see this discussion, because these are all men who could be considered the First Class passengers today given their celebrity status, and hearing how they too would not know what to do was both interesting and insightful. Once James Cameron arrived at the Titanic’s resting place, he went down in a sub, and sent two robots named Jake and Elwood, new robots that are actually on a very thin fiber optic line, deep inside Titanic just to see what there was to see. 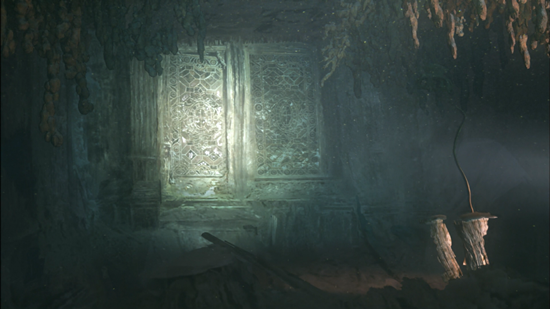 After almost 90 years underwater, Ghosts of the Abyss takes place in 2001, the years had taken their toll on the once grand lady. A lot of the elegant furnishings have been destroyed from being underwater, so grand structures like the Grand Staircase were like empty rooms with very few remnants of what once was. However, with the help of historians and Cameron’s sharp eyes, things were recognizable like the lead glass windows in the dining room, and mantle and clock sitting on a fireplace, and many other interior rooms of the Titanic. 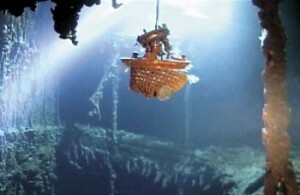 James Cameron used his pair of little robots to really go into areas of Titanic that no one had ever dared go before. Cameron explored some of the Third Class area, some of the areas of the ship where the crew slept, and even little things like dishes, and the letters on the wall that tell people what deck they were on when they stepped off of the elevator. There are so many amazing areas that Cameron explored, and it is also worthy to note that Cameron did something that has not been done since the night the Titanic sank. 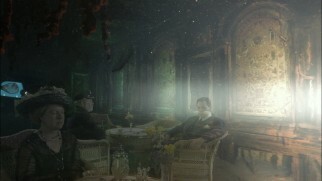 He had one of the subs shine a light through the lead glass windows in the First Class Dining Room. 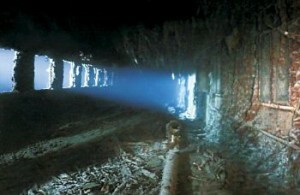 The sight was incredible to see, those windows, which are still intact, having light burst through them as if it was sunshine and not from a submarine in the bottom of the ocean. For Titanic enthusiasts, those lighted windows took everyone back in time to when Titanic was still very much alive and sailing. 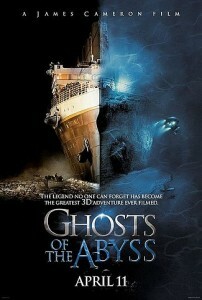 For anyone that wants to see images inside the Titanic, then the Ghosts Of the Abyss movie, and they will be amazed at what they see because. 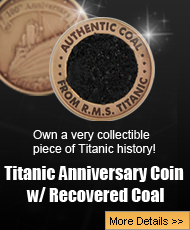 Titanic comes alive more than she has in almost 100 years in this amazing movie, and every Titanic enthusiast should own it.